Carrie Frances Kiene died in 1885 when she was only five years old. 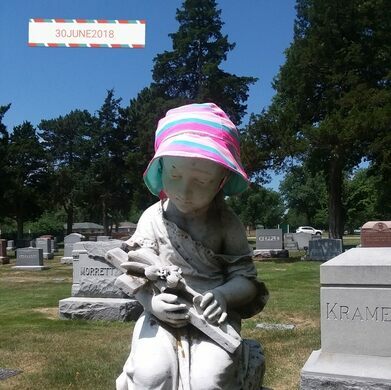 She was later moved to Topeka’s Mount Hope Cemetery, where her parents had a statue of the child erected over her grave. But their tender tribute to their lost daughter isn’t the reason “Little Carrie” has become a local legend. Since the 1990s, an unnamed person has been sneaking into the cemetery under the cover of darkness and adorning the grave with seasonally appropriate clothing. In the warmer months, the statue sports some sort of large, floppy sun hat. When the weather turns cold, the summery garb is swapped for a cozy cap and a big, blanket-like scarf. No one knows exactly when Carrie will receive a new wardrobe. It’s become a quirky local mystery, as people will wander over to the cemetery to keep tabs on the statue’s latest accessories or try to catch a glimpse the elusive stylist in action. Not even the cemetery workers know who’s behind the statue’s ever-changing outfit. A local newspaper reporter once staked out the graveyard and discovered the identity of the mystery dresser, but he refused to reveal anything about the person other than that she’s a woman. The GPS coordinates and address lead to Mount Hope Cemetery. The final resting place of a famous 19th-century murder victim whose identity is still a mystery.